Press and hold the 2 outside buttons for 10 seconds (or 20 seconds depending on the model) until the indicator light flashes. If you sell your vehicle, be sure to erase the programs stored in the HomeLink® memory. • Install a new battery in the remote control transmitter. • The battery side of the remote control transmitter must be pointed away from the HomeLink® button. Operation is subject to the following two conditions: (1) this device may not cause harmful interference, and (2) this device must accept any interference received, including interference that may cause undesired operation. Visit on the web at www.homelink.com or call 1-800-355-3515. The garage door or other devices may operate, so ensure people and objects are out of danger to prevent potential harm. Do not use the HomeLink® compatible transceiver with any garage door opener or device that lacks safety stop and reverse features as required by federal safety standards. This includes any garage door that cannot detect an interfering object. 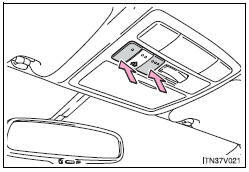 A door or device without these features increases the risk of death or serious injury.